After a longer break due to the holidays, the SBMRL is gearing up for the first race of the new year. This will be the league’s first visit to Argentina to race Autódromo Oscar Alfredo Gálvez in Buenos Aires. Buenos Aires has hosted motor racing events since the early 1930’s, but Formula 1 raced the first Argentine Grand Prix in 1953. The country has had an on-again off-again relationship with the world’s top racing category ever since, last racing there in 1998. The current track is capable of running in two different configurations, and the SBMRL will take the longer one that includes the arena section and the Senna “S” rather than the flat out lake run. The pit straight is extremely long, with the starting grid smack in the middle of it. That will give the field a decent run up to the aptly named Curva Numero Uno. It’s a smooth right hand bend that will keep speeds down but shouldn’t be too much trouble. The circuit curves in on itself into Curva de la Confiteria, which is essentially the reverse of the previous corner. A smooth left then takes the field to be big sweeping right that leads into the back straight. In the configuration to be raced, this is then the longest straight aside from the pit straight, and it’s only about half as long. Still, drivers who managed to get the rhythm right to this point will be well positioned to fly down the straight at top speed. 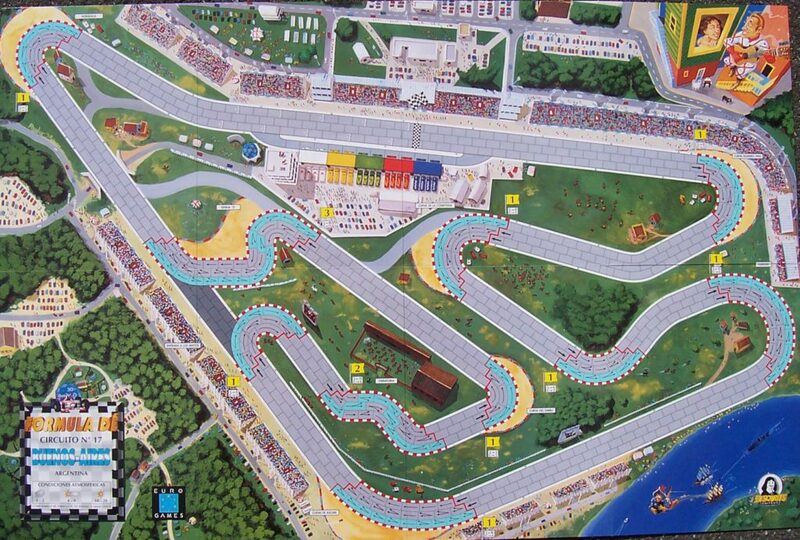 It ends at the high speed Curve de Ascari, which should present little trouble to the drivers. It’s hear that the track will finally force a reduction in speed. The next corner is a sharp hairpin that marks the entry to the arena section. This is one of those unusual corners that fast in, slow out is the optimal approach, as the arena section is slow. Viborita can’t be taken quickly, and the Curva del Ombu is one of the sharpest. A moderate straight then leads into the Senna “S”, which rejoins the arena to the rest of the circuit. This is likely an area that will catch some people out, and a great spot for overtaking. From here, there’s a long straight to Horquilla and the home stretch. Unlike the last race, this race’s starting grid is fairly straight forward. The usual, reverse order of driver standings conditions apply. Only Bubba and Whiplash, who are tied on 49 points, require additional thought. Since Whiplash finished ahead of Bubba in Monaco, he starts behind him here. Pit selection is then in order of team standings, but we currently have a tie with Regency Motors and Sprite Racing. The tie is broken by points scored in the last race since they have the same average starting position. Argentina is not the home race for any driver. This entry was posted in Race Previews and tagged Argentina, Buenos Aires. Bookmark the permalink.